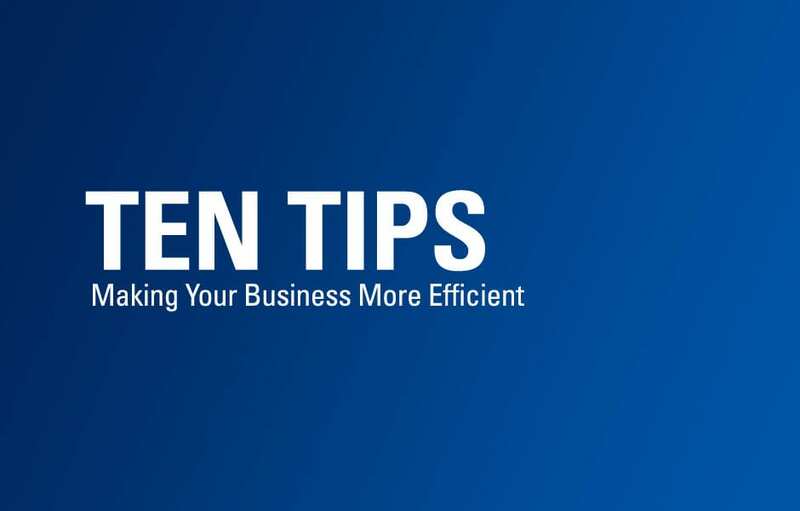 Ten Tips for Making Your Business More Efficient to help your business work more efficiently, cut costs, improve customer satisfaction, and stay ahead of the competition. 1. Give employees secure, consistent access to information. You have an advantage over larger competitors because you can react quickly to business changes. But you can quickly lose this edge if your company network is frequently down, sluggish, or unsecured. A secure, reliable network based on intelligent routers and switches lets your employees access the information and tools they need to keep ahead of competitors. 2. Deliver anytime, anywhere access to employees on the go. To stay productive on the move, your employees need to be able to reach the people and information they need—anywhere, anytime. With tools like virtual private networks (VPNs), your employees can work outside the office and still enjoy safe access to the business network. 3. Create effective business processes with partners. Some large companies make efficient, secure business processes a prerequisite for doing business with them. To meet the business needs of your partners, you need a secure, reliable network. 4. Make it easy to work together. Smooth collaboration between employees, partners, suppliers, and customers is a sure-fire way to boost efficiency while also reducing costs. An intelligent network lets your business take advantage of interactive calendaring, videoconferencing, unified communications, and other technologies for easy collaboration. 5. Enable employees to take their phone systems wherever they go. Missed calls create project delays, wasted opportunities, and lost revenues. With a networked voice and data solution, your employees can have one phone number that rings simultaneously on multiple devices, so customers reach the right person the first time. Your staff can access all their communications from anywhere, checking for e-mail, voicemail, and faxes from just one inbox. Delivering fast, knowledgeable service is the best way to keep customers satisfied. Linking your network phone system to a customer relationship management (CRM) solution is a great way to enhance customer communications. When a customer calls, a pop-up window with their records appears on an employee's IP phone screen, computer screen, or both. 7. Reduce unproductive travel time. All too often, time spent on the road is time lost. A networked phone solution that offers video calls and Web conferencing can help reduce the time and expense of traveling to offsite meetings and training sessions. Instead of spending time traveling, you can use the time to get work done with technology. 8. Employ a managed service provider. Is managing a network the best use of your employees' time? In some situations, it is advantageous to hire a managed service provider for network administration. Working with a managed service provider can free your IT staff to focus on other IT tasks and use their time more effectively. Aging phone systems and slow networks can frustrate your employees and annoy your customers. In some cases, an employee might become burned out and decide to move on. To help ensure that employees are productive and satisfied, your business needs a secure, reliable, and fast network. 10. Develop a long-term technology plan. The process of replacing obsolete hardware can interrupt your employees and bring the office to a standstill. You can minimize such disruptions by carefully determining short- and long-term business objectives and working with your network vendor to deploy technology that matches them. Contact your VCIO or call 1.866.PICK.ITS today to discuss ways which we can help reduce your IT costs while increasing efficiencies within your business operations. Here are 10 tips for using network management to help your business work more efficiently, cut costs, improve customer satisfaction, and stay ahead of the competition.